Postcolonial Kenya has seen a significant amount of development, both politically and economically, since its independence in 1963. Starting with the presidency of Jomo Kenyatta, the nation prospered -- experiencing economic growth of at least 5% for over a decade (Barkan, 2004). The civil service was highly regarded, well paid, and the prospect of corruption was hardly visible. Unfortunately, the presidential succession by Daniel Arap Moi did not account for the same positive conditions. After Moi took power in 1978, many governmental entities languished, due to his repressive regime. By the 1990’s, the civil service declined, the judicial system lost much of its power, and the economy sank, with poverty rates rising 8% (Barkan, 2004). When Mwai Kibaki began his presidency in 2002, Kenya was at one of its worst places in history, putting Kibaki in a position to either make significant changes or keep Kenya in its destructive state. 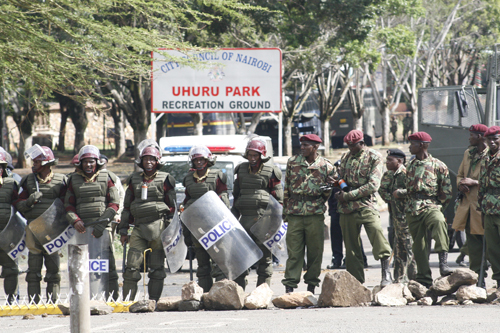 Military police training near Uhuru Park in Nairobi, Kenya. Unfortunately, along with political and economic instability comes an increase in crime and disorder. East Africa, as a whole, is a region of high crime rates due to a number of factors, several of which have no feasible short-term solutions. As of present day, Kenya is rated by the U.S. Department of State as Critical in terms of both terrorism and crime, making the United States Embassy in Nairobi the fourth largest in the world. The porous borders between countries as well as the extensive coastline make it difficult to accurately track and pursue criminal activity. The median age in East Africa is between16 and 19 years old, which is directly in the center of the average criminal demographic worldwide. This means that there is little likelihood for a decline in crime rates anytime in the near future (UNODC, 2009). In addition to the above factors that offer little hope for crime experts worldwide, there has been a significant decrease in active policing and law enforcement in Kenya, while criminal behavior is steadily increasing. Recent United Nations surveys in Kenya have shown that over half of the population worries about crime constantly and roughly 75% feel unsafe while at home (UN - Habitat, 2002). The lack of training and low pay for the Kenyan police causes a considerable level of corruption and a general lack of aggressive policing, with 98% of Kenyans believing there is some level of corruption in the force (UN - Habitat, 2002). This research article discusses the elements of crime and policing in Kenya along with their relationship to globalization, development, and sustainability. The criminal justice system in Kenya is still a work in progress. Initially created during Colonial rule, the system merged British Colonial law with the ideals thought to be important to native Kenyans at the time. After the Mau-Mau uprising against the British in the 1950s, many Kenyans were determined to create a crime policy that coexisted with their tribal lifestyle. With 78 percent of Kenyans living in rural areas as of the year 2009 (Ministry of Land, 2009), it is unfeasible to expect a formal police and justice system throughout the entire country. Within many provinces, there are districts led by Chiefs and District Officers. These elected officials act as government representatives and handle many of the criminal matters without any formal involvement from larger governmental entities. The Kenyan law enforcement network is split into several sectors all comprising the police force. Since the last major reorganization in 1953, the Kenyan Police Force, under the direction of the Police Commissioner, is comprised of the Regular Police, General Service Unit, Criminal Investigative Department, National Security Intelligence Service and the Administrative Police. Each with specific goals and functions, the Swahili phrase Utamishi Kwa Wote (service to all) acts as the guiding motto for officers nationwide (Maina et al, 2004). The Regular Police conduct day-to-day street operations and act as the visible face for all Kenyans to see. The General Service Unit (the main firearm carrying division of the police) takes part in major uprisings and events and is, according to a prominent Kenyan figure in the Kibera Slum, “feared by nearly everyone” (Anonymous, personal statement, 2010). The Criminal Investigative Department (CID) performs many undercover operations and acts as a very close liaison to the U.S. Embassy in Nairobi. The Administrative Police, given the task of securing the borders of Kenya, work in many rural areas on the outskirts of the country, with a larger concentration to the north. Following the 1998 attacks on the U.S. Embassies in Nairobi and Dar es Salaam (Tanzania), the National Security Intelligence Service was created. This unit acts as an intelligence gathering service and does not have any significant face-to-face contact with the Kenyan people. The above divisions of the Kenyan Police Force all face numerous challenges when dealing with crime in Kenya. For one, the base monthly salary of a Kenyan police officer is eleven thousand shillings [roughly 143 USD] (Mukinda, 2010). The mere lack of assets and unsustainable lifestyle inherently breeds corruption. Kenya, as a whole, rates in the top 20% of corrupt countries worldwide as per the latest Corruption Perception Index (Ndegwa, 2009). Within Kenya itself, the highest rating corrupt body is the police force, holding an aggregate index of 57 percent (Kenya Bribery Index, 2008). This significant level of distrust between the public and the police drastically increases the challenges of effective crime control. Due to Kenya’s struggling economy, there is simply not enough money going towards policing and security. The ratio of police to citizens throughout Africa is roughly half of that in North America and Europe, with rates of 180 per 100,000 compared with 346 and 325 respectively (UNODC, 2009). The subsequent consequences of an understaffed and struggling police force are a lack of training, poor equipment, and general incompetence (Maina et al, 2004). Moving forward in the last several years, the Kenyan Police Force has embarked on a mission to improve public relations and operations through community policing, increased qualifications, and professional training programs instituted by foreign governments and NGOs. Assistant Commissioner of Police Tom Omani stated that the major turning point in policing began in 1998 following the Kenya terrorist attack, however, gained the most momentum after Kibaki took power. In Mr. Omani’s opinion, the most important change to the criminal justice system in Kenya is the community policing initiative, which asks for input and help from Kenyan citizens. While it is a slow process to regain the trust of most Kenyans, Omani is confident that crime cannot be fought by police alone and that it is prerequisite of controlling crime to have help from the community (Omani, personal statement, 2010). Trends in crime throughout East Africa, specifically Kenya, are frequently evolving, giving law enforcement the difficult task of remaining vigilant. With advancements in global technology comes the emergence of criminal activity. In terms of Kenya, the major problems include: Terrorism, maritime piracy, human/drugs/arms trafficking, and cyber crime. Unfortunately, most law enforcement officials worldwide do not see solutions to any of these problems in the near future. For one, a vast majority of the responsibility for all crime in Kenya can be attributed to the porous borders that surround the country. Surrounding Kenya is the failed state of Somalia, war-torn Sudan, and crime-ridden Ethiopia and Uganda. Without proper border control, there is simply no realistic way to create a secure country. The U.S. Legal Attaché in Nairobi makes it very clear that there is no way to accurately assume the number of people crossing through the Somalia-Kenya border. However, he would estimate that 100,000 undocumented foreigners make entry into or exit Kenya every day (Legal Attaché, personal statement, 2010). This figure is exceptionally upsetting when it is considered that Somalia houses al-Shabab, a terrorist group with self-declared ties to al-Qaeda. The presence of al-Qaeda in Kenya is directly responsible for the 1998 bombing of the U.S. embassy in Nairobi, therefore, leaving an innate hatred of the terrorist group for nearly every Kenyan. Besides the 1998 terrorist attacks that left over 200 people dead in Kenya, there was another significant attack that occurred in 2002. The Kikambala bombing in Mombasa was equally as gruesome and created an even more substantial cause for concern among Kenyans and law enforcement officials worldwide. A pro-Palestinian organization from Lebanon planted a bomb at an Israeli owned hotel in Mombasa killing and injuring dozens of people. In addition, two missiles were shot from land into the air and narrowly missed an Israeli charter plane. The missiles were neither used nor manufactured in Kenya, therefore, only could have entered the country through illegal means (The Threat from Portable Missiles, 2002). The international response was firm and expected but it was later made public that the Intelligence Community worldwide had knowledge of an imminent terrorist attack and failed to act on the information (McDermott, 2002). According to an official at the U.S. Embassy in Nairobi, the biggest consequence of a terrorist attack, besides the obvious loss of life, is the impact on tourism. As the second largest source of income for Kenya (after agriculture), “the tourism industry in Kenya has suffered [over the last decade] from the issuance of travel advisories by foreign governments” (Onyango, 2010). Every subsequent attack that takes place in Kenya further destroys the tourism market and makes surrounding nations that much more enjoyable (RSO, personal statement, 2010). Most Kenyans, regardless of ethnicity or religion, understand these consequences and justifiably want solutions to the issue of terrorism. It is important to note that the embarrassment felt by Kenyans is universal but especially deep for Muslims. The Islamic community in Kenya is generally conservative but seldom fundamentalist. As a spokesperson for the Islamic population in the Coastal Province, Alawy Abzein reiterates that Muslims cooperate with the Government of Kenya to help catch those responsible for terrorist attacks (Abzein, personal statement, 2010). Reliable information was given to the Government of Kenya in 2008 regarding the whereabouts of Fazul Abdullah-Mohammed [the suspected mastermind behind the U.S. Embassy bombings], however, he narrowly escaped the search by Kenyan officials and is believed to be currently living in Somalia. Even if suspected terrorists are found, Kenya has no anti-terrorism laws in its judicial code. This means that Kenyan prosecutors must charge suspects with substantially less serious offenses, making it both difficult for a conviction and severely lenient even with a guilty verdict. Seven of the subjects arrested as a result of the Kikambala bombing were not tried successfully the first time in court (RSO, personal statement, 2010). This could be attributed to both ineffective legislation and the lack of competent prosecutors. Most criminal prosecutions in Kenya are handled by Police Prosecutors who have minimal legal training. The system is based on British ideology from before Kenya’s independence and unfortunately, no longer works successfully given the present day environment. Kenya, as a whole, has an average of 74 public prosecutors countrywide leaving a significant gap between the many trials and the extent of manpower. According to legal expert Robert Bowman from the U.S. Department of Justice, such a small number of legitimate prosecutors creates an abundance of problems ranging from corruption to poorly handled trials and basic incompetence (Bowman, personal statement, 2010). Given the wide range of offenses throughout Kenya, conducting specialized training in emerging crimes for Kenyan officials would have the potential to make a profound difference in the criminal justice system both in terms of logistics and economics. A relatively new and threatening trend in East Africa is the attacks by pirates off the coast of Kenya. Young adults, who are generally in poverty and uneducated, are recruited by crime bosses in Somalia and Kenya in an attempt to extort money from commercial and private ships in the Indian Ocean. Unfortunately, due to the adolescence of the trend, most Kenyan law enforcement officials and prosecutors are untrained to deal with the severity of the issue. Frederic Ischebeck-Baum, lead prosecutor for the United Nations Anti-Piracy Program, makes it very clear that there will always be young impressionable candidates who are willing to do illegal work for small sums of money. Nevertheless, it is up to the international community [with an emphasis on Kenya] to target the wealthy crime bosses who live on the eastern coast of Africa and create legitimate job and educational opportunities for the youth involved. (Ischebeck-Baum, personal statement, 2010). With a coastline of 536 kilometers (CIA World Fact Book, 2010) and a relatively ineffectual navy, it is simply impossible for Kenya to handle the problem of maritime piracy by itself. Fortunately, the United States has opened a training facility on Lamu Island to assist the Kenyan Police Force and military in capturing suspected pirates. Nearly 8 million USD annually gets put towards the training facility while the Government of Kenya contributes no funds (RSO, personal statement, 2010). Monetary assistance and international oversight can assist in curtailing maritime piracy off the coast of Kenya to a limited extent. The Government of Kenya still has a responsibility to its people to take control of its nation’s borders and coasts without significant intervention by foreign entities. Abzein, A. (2010). Interview with Alawy Abzein. Mombasa, Kenya. Anonymous. (2010). Kibera Slum Interview. Nairobi, Kenya. Barkan, J. D. (2004). Kenya After Moi. Foreign Affairs, 83 (1),12. BBC. (2002). The Threat from Portable Missiles, BBC Africa (29 November 2002 ed.). BBC. (2010). Somali Islamists al-Shabab 'join al-Qaeda fight'. Mogadishu, Somalia. Bowman, R. (2010). Interview with Resident Legal Advisor. Nairobi, Kenya. Florian Hugenberg, W. O. A., Angela Mwita. (2007). Firearm Injuries in Nairobi, Kenya: Who Pays the Price? Journal of Public Health Policy, 28, 10. Ischebeck-Baum, F. (2010). Maritime Piracy in East Africa. Nairobi, Kenya. Kenya, Transparency International (2008). The Kenya Bribery Index. Nairobi, Kenya. Legal Attache. (2010). Interview with Federal Bureau of Investigation at the U.S. Embassy. Nairobi, Kenya. Maina, E., Oboka, Wycliffe, Majong'o, Julius. (2004). History and Government (3 ed.). Nairobi: East African Educational Publishers Ltd.
McDermott, T. (2002). Hints Ahead of Kenya Attack. Jerusalem: CBS News. Mukinda, F. (2010, 21/5/2010). New Pay for Kenya Police on the Way. The Daily Nation. Ndegwa, A. (2009, 19 November 2009). Kenya Leads Corruption Perception Index. The Standard. Nairobi, Kenya. Omani, T. (2010). Interview with Assistant Commissioner of Police. Nairobi. Organised Crime and Trafficking in Eastern Africa. (2009). Nairobi, Kenya: United Nations Office on Drugs and Crime. Stavrou, A. (2002). Crime in Nairobi. Nairobi, Kenya: United Nations Habitat. Samuel L. Aronson graduated in 2013 with a Masters degree in Conflict Studies from The London School of Economics in London, United Kingdom.